The announcement of a direct sequel to one of its foundational classics was the creamy center of Wednesday’s Nintendo Direct presentation, but The Legend of Zelda: A Link to the Past 2 was just the first of many new games discussed for the Nintendo 3DS. Nintendo discussed release plans for a number of new 3DS games that had been previously announced, but also revealed brand new games expected out before the end of the year that are at least tonally related to A Link to the Past 2. Like that game, Nintendo’s other reveals show that the developer is relying even more heavily on its past than it has before, plumbing its fertile properties from the 1990s to bolster the Nintendo 3DS. The first of these is a new Yoshi’s Island for the handheld. 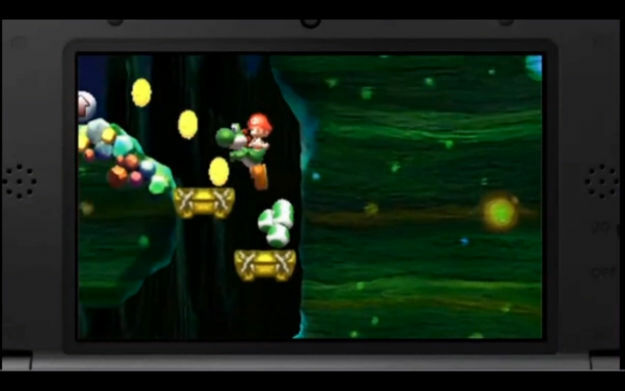 Like A Link to the Past 2, Yoshi’s Island 3DS is a sequel to a beloved Super Nintendo game. It is also, however, a modernization that uses polygonal graphics at the same time as it apes the painterly sprite work of the originals. The look is an intriguing mix of old and new, and manages to avoid some of the plasticky sterility that’s marked Nintendo’s other retro revival series, New Super Mario Bros. Joining Yoshi’s Island is Mario Party 3DS. Mario Party has been a staple of Nintendo’s release schedule since the original landed on Nintendo 64 in 1998. The series has been largely dormant in recent years, though, with Nintendo Wii and DS versions coming in 2007 before the series went into an extended hibernation. Mario Party 9 was released quietly for Nintendo Wii in 2012, but Mario Party 3DS looks to breathe new life into the franchise by incorporating AR-based minigames. It is a novel use of the 3DS hardware that could change one of Nintendo’s most staid series. The other announcements covered previously revealed games. Donkey Kong Country Returns, an enhanced remake of the 2010 Wii game, will be out May 24, followed by Animal Crossing: New Leaf on Jun. 14, and Mario & Luigi: Dream Team on Aug. 11. In 2014, Nintendo will bring over Professor Layton and the Azran Legacy, the final adventure for the titular puzzle solver. Nintendo will also localize and publish Square-Enix’s role-playing game Bravely Default: Flying Fairy, a new game that recalls many of the role-playing classics that defined the Super Nintendo.